Oh nuts, we are out of muffins….again. That’s no good! I didn’t go far from my favorite recipes to make these, possibly my favorite muffins of all time. 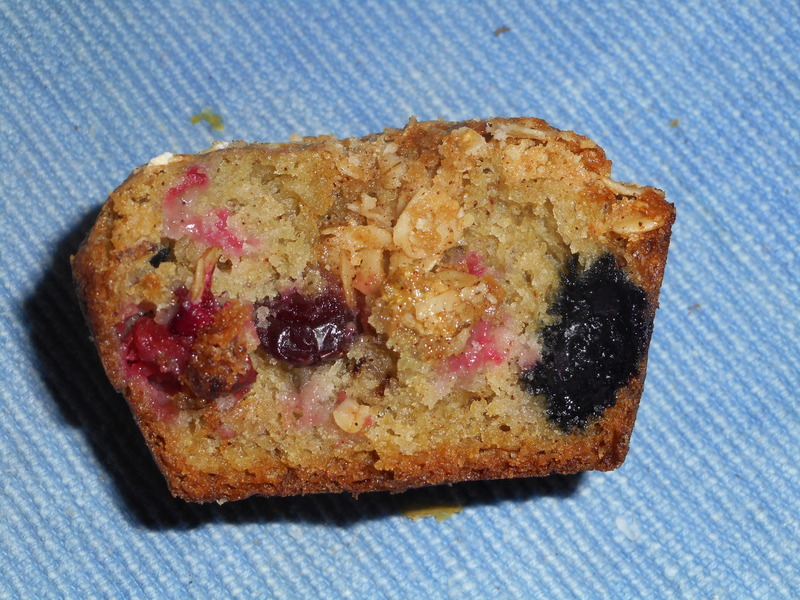 This is a riff on my fall of 2014 take on a muffin recipe out of Annalise Robert’s cookbook; Gluten-Free Baking Classics; her blueberry muffins but with a special topping. If you are looking for a great source recipe book this is it: her gf quick breads are particularly delicious, all my gluten loving friends and family enjoy them. I made her brownies this past weekend; always perfection and rapidly devoured. I have a confession to make: I have never been a big fan of cranberries. Until this winter! I decided to experiment with them and found that they play very well with a variety of fruits for muffins, tarts, pies and crisps. The cranberries brighten the flavor and add a lovely rosy color. Do look beyond your prejudices to their sharp flavor and give them a second try. I am so glad I did. These muffins did not disappoint: delicate texture yet slightly crunchy outside with a great fruity flavor and just enough sugar for me. 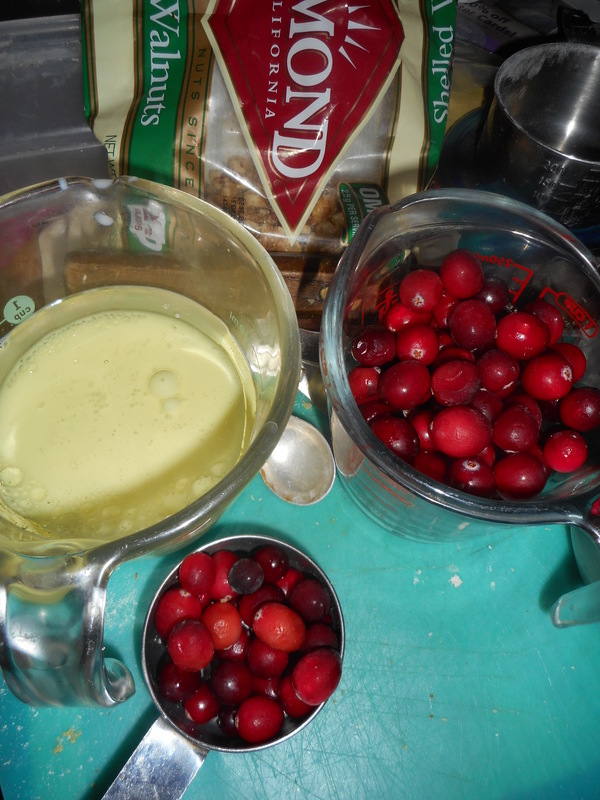 To measure I poured about ½ cup of blueberries and added the rest of the measure out of the bag of cranberries. I used frozen fruit; easy to get in the winter, don’t defrost them before adding. 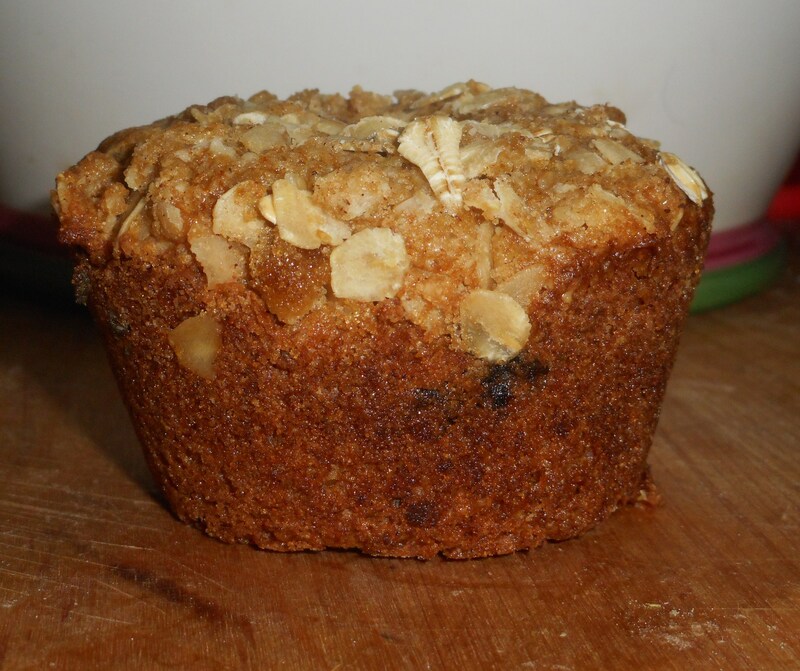 The streusel topping insures that they look straight from a gluten free bakery. 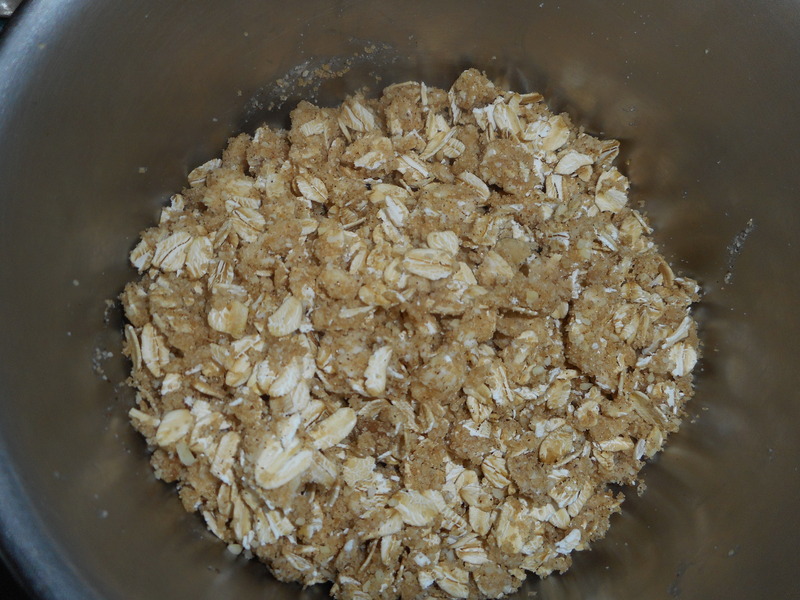 There are walnuts in there so you get some really great nutrients from the fruit and nuts. Not much guilt in eating one of these treats! You can swap the white sugar for coconut palm sugar which is very low as far as raising blood sugar. I am out of it so I had to go with what was in my pantry. I like to test eat a muffin from the batch while they are still warm out of the oven, at the moment of perfection. This version is perhaps my favorite of every single muffin recipe I have tried. Here are the pictures I took while making these muffins. From the outside they look somewhat plain so I took one shot of a cross section so you could see the baked fruit inside this yummy breakfast treat. Directions: Heat your oven to 375 degrees, placing the rack in middle of oven. Spray muffin pans with cooking spray. One batch makes 12-16 muffins. I got 16 when I made them. Fill muffin pans 2/3 full. I use a big serving spoon and fill it about half way to dump in each muffin space. Sprinkle the top with the topping. Press it in a bit so it won’t flake off after baking. Bake 21-23 min until golden brown. Do not over bake or they will taste dry. Remove immediately from the pans and cool on a rack. They freeze well for a few weeks, if they last that long. Keeps in fridge (well wrapped) or an airtight cookie jar for 2-3 days.